* Flush the drain lines with compressed air supply with this unique Jones Valve. * Remove Clogging from upside & downside with the same valve. * 1/4" Hose connection, male flare w/ Schrader. * Durable, Schedule 40 PVC Material. * Attaches to CO2 or Nitrogen tanks. * Smallest, and easiest to use of all available drain line valves. * Most economical solution for HVAC & R drain lines. 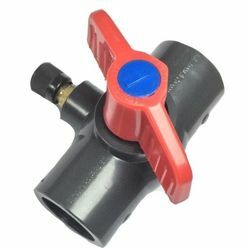 * Flush the drain lines with compressed air supply with this unique Jones Valve. * Remove Clogging from upside & downside with the same valve. * 1/4" Hose connection, male flare w/ Schrader. * 3/4" Condensate line. * Durable, Schedule 40 PVC Material. * Attaches to CO2 or Nitrogen tanks. * Smallest, and easiest to use of all available drain line valves. * Most economical solution for HVAC & R drain lines.